If it’s not hot where you are now, it’s going to be! And you must be armed with a great summer beverage/smoothie/slush. The kids and I made these a couple of nights ago and then froze them so we could enjoy them again a 2nd day. And if I am being honest, I don’t really drink my slushes out of a mason jar. But I thought it looked pretty cool AND because we had leftovers that we needed to freeze, the jars were the perfect answer. I like this slush for 2 reasons. One being that one of my favorite fruits is a mango. And two, I love the refreshing taste this slush has! 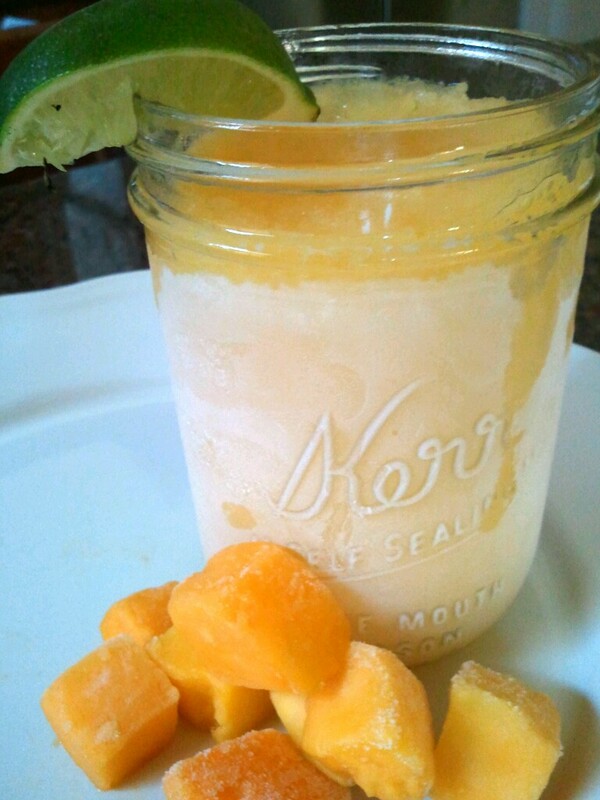 Combine chopped mango, limeade concentrate, Sprite, and orange juice in a blender. Blend until smooth. Add ice until the blender is full. Blend until smooth. Pour into small mason jars or cups and drink. If you are freezing your slush, pour in mason jars and put lid on securely. When you’re ready to serve, remove the jars from the freezer. Let thaw about 10 minutes. Use a straw or fork to stir up the slush. Add a lime slice and serve.